The XBUTT double-level terminal blocks reduce space requirements by 50% over single-level terminal blocks. 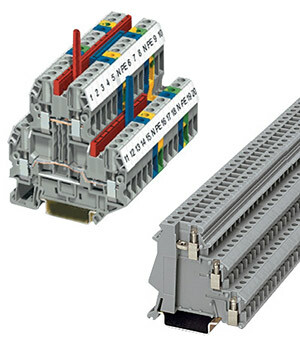 These terminal blocks are suitable for 2-wire RTD connections. The XBUTT Series can be bridged on both levels for maximum flexibility. Marking can be provided at each termination point. The XB3UKA sensor terminal blocks reduce installation time by terminating three-wire devices such as photoelectric and proximity sensors in a single terminal block. The upper level accommodates the markable feed-through terminal for the signal line, while the two lower terminal points are used for the sensor power supply. The lower two terminal points can be bridged, reducing your wiring for sensor power. The XB3UKF 3-level terminal blocks provide three feed-through signal paths. These terminal blocks are suitable for 3-wire RTD connections.